On 24th November 2013 the Photo of Swami Vivekananda was installed at RangFraa College, Changlang, Arunachal Pradesh. 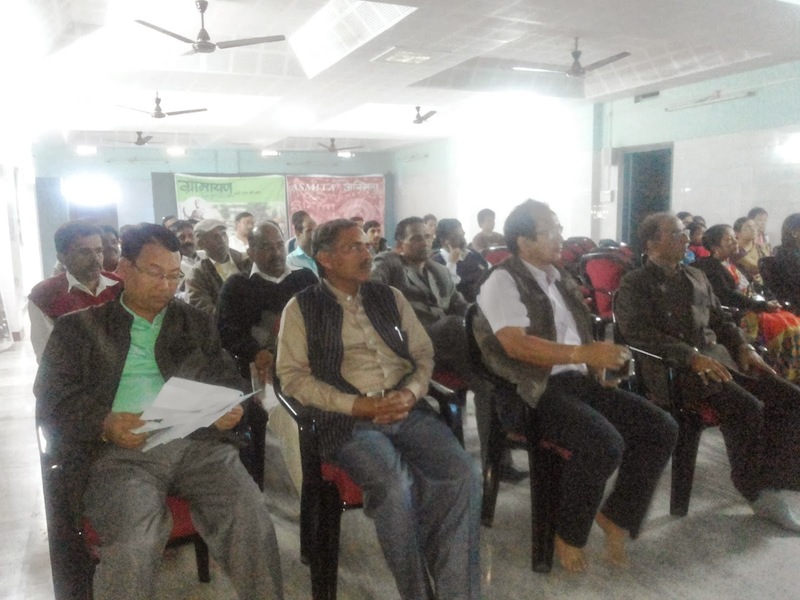 The 150th Birth Centenary Celebration Committee of Changlang district initiated the programme under Yuva Shakti Ayam. The Photo was inaugurated by lighting lamp by Dr.D.Techai, Coordinator, 150th Birth Centenary Celebration Committee,Changlang along with the senior Karyakartas of Vivekananda Kendra. 60 college students attended the programme. After the inauguration Sri P.G.Tago,Principal In-Charge, RangFraa Govt.College ,Changlang delivered a thought provoking lecture and appealed the college students to follow the path of the Great Saint, Swami Vivekananda. Dr.D.Techai delivered the concluding speech and highlighted the programmes organized by the celebration committee during this year. Vivekananda Kendra, Capital Complex organized Sadhana Diwas (The Birth Day of Mananiya Eknath Ranade, the founder of Vivekananda Kendra) on 16th November 2013, In advance due to some unavoidable circumstances. other wise the birthday fall on 19th November 2013. All the Karyakarta of Vivekananda Kendra, Right from Saha Prant Pramukh Dr. Tejum Padu and Principal with teacher of VKV's and all the Karyakarta were present in the Utsav. 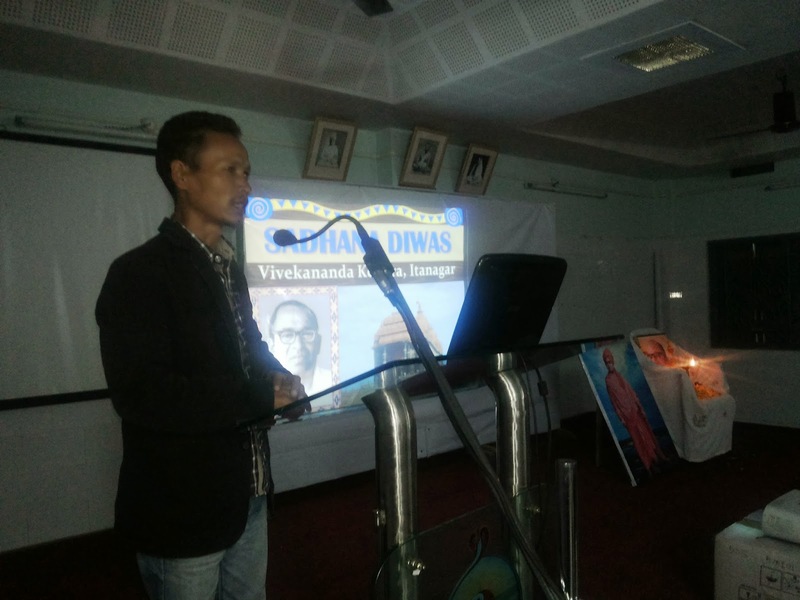 Among one of the five major Utsava’s of Vivekananda Kendra “Sadhana Diwas” was also celebrated at R.K. Mission Conference hall, Itanagar. The Programme started with three omkar and Geet “Hum Anuyayai Eknath Ke “ By Shri Akal Bayor, Vivekananda Youth Prayer Centre Pramukh. The Gathering was Welcomed by Shri Taba Tatup, Prant Karyalaya Pramukh, Swami Vivekananda Sardha Shati Samarom, Arunachal Prant. While Speaking on the life sketch of Mananiya Eknath Ranade on Power point Presentation Shri Kalyan Dutta, Mahanagar Pramukh, said that karyakarta need to follow the example Shown by Eknathji through his Tyag aur Sewa and determination to achieve the target as planned for the Completion of Vivekananda Rock Memorial at Kanyakumari along with building up of memorial with flesh and Bone called Vivekananda Kendra. He said in spite of all the hurdles and resistance, Eknathji was always positive in his thought process to give a momentum to the twin Ideal of “Man Making and Nation building”. Eknath Ji always insisted Karyakartas and others to imbibe in mind that “THEY ALONE LIVE WHO LIVE FOR OTHERS, REST ARE MORE DEAD THAN ALIVE” and “EACH SOUL IS POTENTIALLY DIVINE”. Then followed by display of Documentary film on Construction of Vivekananda Rock Memorial at Kanyakumari. Shri Tara Dajam, Nagar Pramukh, Itanagar briefed the audience about the activities of Vivekananda Kendra in Arunachal Pradesh like Arun Jyoti Project, Vivekananda Kendra Vidyalaya & Vivekananda Kendra Institute of Culture Arunachal chapter. Dr. Tejum Padu, Deputy Director higher and technical education Govt. 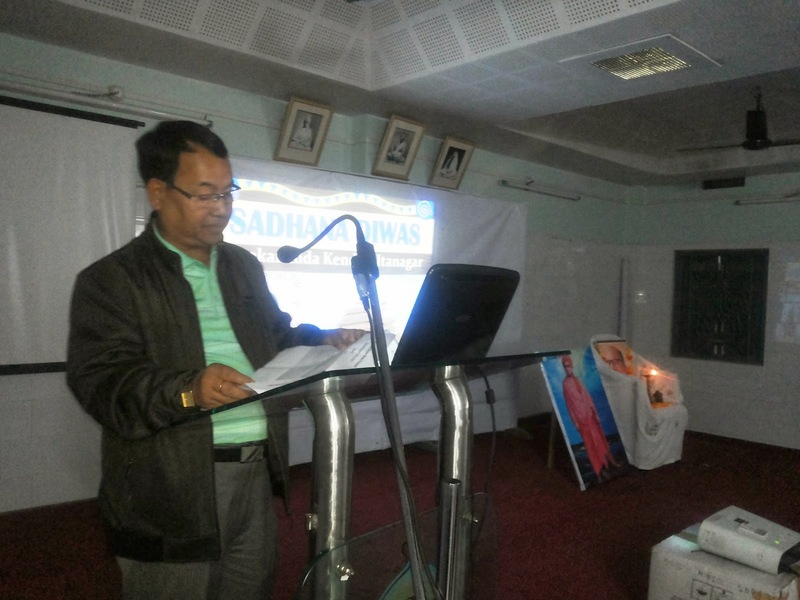 of Arunachal Pradesh and Saha Prant Pramukh, Vivekananda Kendra Arunachal Pradesh delivered ”Key note Address“. He said we must get ready to prepare ground for the forthcoming Mananiya Eknathji Ranade Shatabdi Samaroh from 19 Nov 2014 to 19 Nov 2015. He also said that the faith in God means faith in oneself. Thus we should not be blaming society/fate for all the misfortune but should develop ourselves, raise ourselves, take responsibility on our shoulders to work like lions. The Dharmik Jagaran or spirituality is not merely religious activity but it is feeling one with the Virat, with the people. And therefore with all conviction and determination to give our committed time and energy for serving the society. 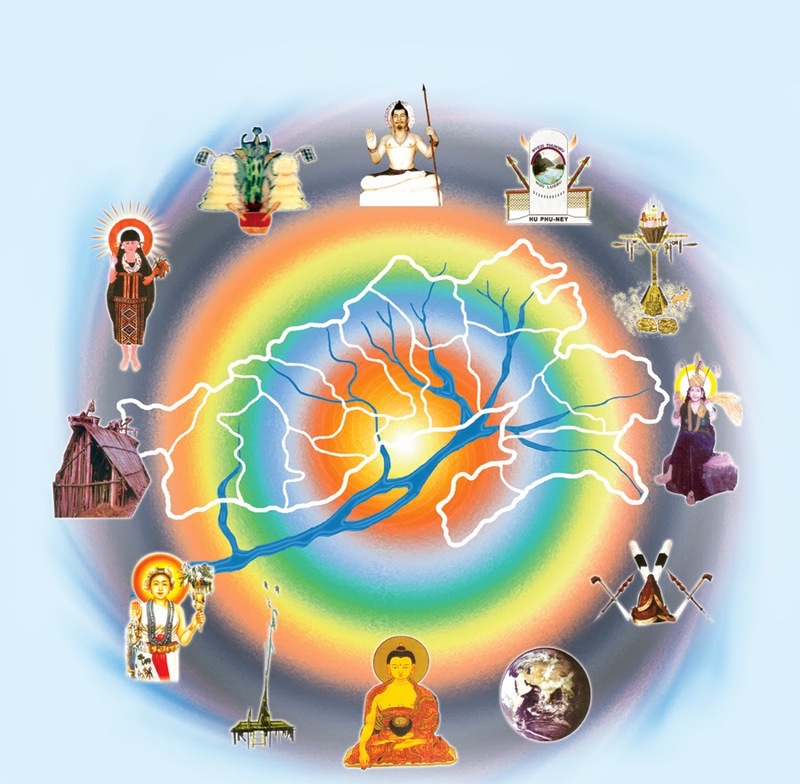 This is real Sadhana – worshiping the Virat with our selfless actions. He also Spoke about importance of “Sadhana Diwas” and advised that the Sadhana of teachers, professional, students and common man should not be in gaining materialistic things rather then ones Sadhana should be to see others for better up-liftment of society and nation in general. Shri Ashok Atale, Nagar Sangathak VK Itanagar briefly explain about the Karyapadhdhati, Other service projects of Kendra, the types of Karyakartas like Sthanik Karyakarta, Vanaprasthi Karyakarta, Sevavrati Karyakarta, Jeevanvrati Karyakarta. Pariposhak schemes through Patron drive and detail planning of VK Arun Joyti project etc. Entire Programme was well coordinated and anchored by Kum Bobita Tayam. The programme ended with Shanti Mantra.